Rustic Bathroom Shelf with Towel Bar, Industrial Pipe and Wood Towel Rack, Modern Farmhouse Towel Hanger, Ships from Detroit, Michigan by Long White Beard at Nicky's Blog. Hurry! Limited time offer. Offer valid only while supplies last. 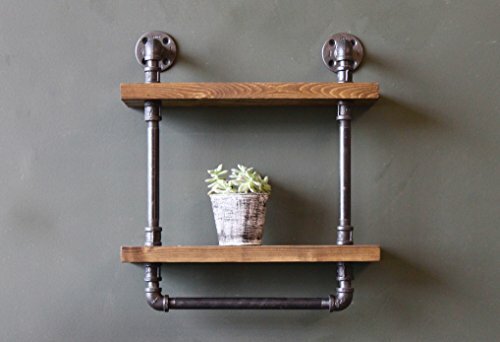 These rustic shelves feature an industrial style towel bar and pipe brackets, and each one is made by hand in our workshop near Detroit, Michigan. These rustic shelves feature an industrial style towel bar and pipe brackets, and each one is made by hand in our workshop near Detroit, Michigan. With just the right amount of storage and room for decoration, these shelves make a perfect fit for your casual kitchen or bathroom. The wood shelves are hand-finished, then clear-coated for protection so you won't have to worry about spills or drips. Shelves are finished in our popular "Blackened" finish (other finishes are available by request). Our 1/2" industrial pipe is cleaned, sealed, and built to last. Each Double Shelf Towel Bar comes with standard mounting hardware (screws + anchors), and as always, the screws are color-matched to the pipe to keep things classy. Size is Approximately 18" x18" x 5". Shelves are Approximately 1.5" thick; dimensions will vary slightly as each piece is unique & made by hand in our shop. For items made with industrial pipe, we use only cleaned, de-greased pipes. This is done to remove any oil or grease left over from the pipe manufacturing process. After cleaning, the pipes are sealed with clear-coat to preserve the metal finish and to prevent rust. Our pipes will not stain, smear, or otherwise damage your towels, your clothes, or your home! If you have any questions about this product by Long White Beard, contact us by completing and submitting the form below. If you are looking for a specif part number, please include it with your message.